Sunflowers are know to follow the Sun, the phenomenon is called heliotropism. At sunrise, the faces of most sunflowers are turned towards the east. Over the course of the day they follow the sun from east to west, while at night they return to an eastward orientation. 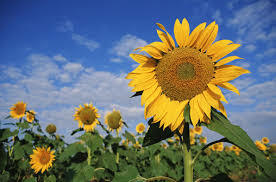 Greece has lots of Sun and the Sunflower in many way represents the Sun. Our Sunflower Suite is in honor or the Greek Sun! A Living Room with two matresses for occasional sleeping, perfect for small children. Suite Amenties include air-conditioning, fridge and a safe. Heaven Naoussa is in the center of Naoussa, the beautiful little fishing village on the North Coast of Paros, within walking distance of the port, the village center, beaches and more (only 200 metres)! Don't wait... Book you stay ay Heaven Naoussa Now! View here our Suites Photo Gallery.